After trying to grow peaches this year, I think I may turn to something easier, like rearing silkworms or raising sea monkeys. My optimistic nature suffered as an unusually long, wet spring hindered pollination, and cooler-than-average summer temperatures thwarted vigorous tree growth and fruit ripening. The final blow came when several trees just gave up and died (not counting the one I dispatched accidentally with a moving vehicle). The Kreibich Nectarine tree finally produced fruit and then a couple weeks before ripening, the rains came and ruined the meager crop. 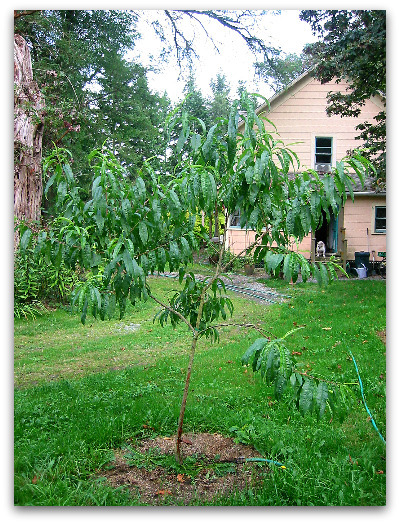 The following trees are peach leaf curl resistant varieties that I planted three to seven years ago on Vashon Island, which is Zone 8, a moderate climate that ranges from 35-45 degrees daily in January to 55-75 degrees in August. 2009: Died. May it rest in peace. The tree was planted bareroot one year ago and it succumbed to peach leaf curl this spring and never recovered. 2010: One tree died from a borer (no to be confused with a bore) or some form of root rot, but the other (in a sunnier, dryer location) is thriving. No peach leaf curl this year, and still no peaches. 2009: I love this peach and am not giving up on it. Good growth from one tree, minimal from the other. No leaf curl to report and no fruit set either. Again, this was a great backyard peach when I lived in Seattle. 2010: The tree is thriving in full sun, and seems healthy, experiencing no leaf curl. The blossoms are diminutive and appear in early spring, so pollination is a challenge. I harvested two handfuls of peaches with delicious, white flesh. 2009: A big year for growth, stands about 12 feet high, and produced beautiful small peaches of high quality. I was surprised to see they were white peaches (a favorite of mine). I picked them a little green to thwart the raccoons, and they ripened very nicely off the tree. (Here’s the technique and best way to ripen peaches off the tree.) Not sure if this is the same as Royal Charlotte peach. 2010: I can see why Frost is the most widely planted leaf curl resistant variety in the Seattle area; it’s pretty reliable and flavorful. I picked about six pounds of peaches and enjoyed them all out of hand. 2009: Finally seems happy in its transplanted place, with nice leaf and stem growth and six large and delicious golden peaches picked. It appears to be a Frost peach, the mainstay of PLC varieties and I can see why. Very nice peach. 2008: Transplanted from a garden where peaches had no place (gasp! ); good growth three years later, no leaf curl, and two of my best peaches so far. 2010: I love this peach tree because it pulls through no matter what. If suffered some leaf curl, but rebounded nicely. The skin of the peach is really tough which is to its benefit in keeping insects at bay. No bumper crop this year, but picking a few of something is better than picking a whole lot of nothing. 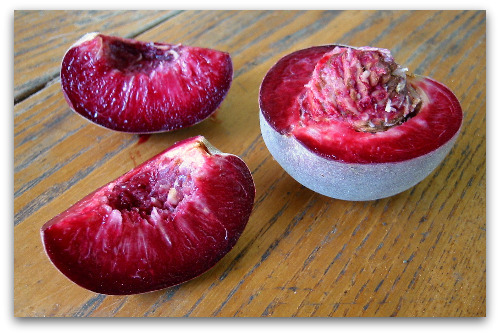 The flesh of the peach was intensely purple this year and wonderfully tart. 2009: Gorgeous healthy tree of 12 feet, a little twig die-off here and there, but seems quite healthy, but no fruit set this year, only 3-5 peaches currently hanging on. It may be a biennial producer. 2008: Vigorous growth, beautiful ornamental blossoms, no leaf curl, harvested 30 medium to small peaches Oct. 12, thick fuzzy skin almost brown in color, juicy fruit, deliciously tart when shy of ripe, when ripe bursts with flavors of blackberry, plum and peach. 2007: Vigorous growth, leafed out with minor leaf curl, nice fruit set, harvested 6 small peaches on Oct. 2, superb flavor, gorgeous burgundy flesh. 2010: This tree was never really happy here and never exceeded five feet in height. I may try it again in a sunnier, dryer location, but for now, I’m bidding adieu to this Bay Area sport. 2009: minimal growth, leaves slow to appear, no leaf curl, minor fruit set (4 peaches), then fruit dropped. Tree is still only about 4 feet tall. I may transplant it this winter. 2010: Its best year ever in vigorous growth and fruit production. Unfortunately, the fruit is highly susceptible to splitting after rained upon. This could be a big problem for the Northwest grower, even though our summers are usually quite dry. 2009: A promising variety, very healthy, but no fruit set. Stands about 6 feet tall now and had a setback when it became the chosen entrée for some wayward deer. 2010: One tree died, but one in a sunnier location seems to be responding nicely. No leaf curl to speak of and the same can be said for its fruit production. I’m hopeful but not holding my breath. 2010: This tree is quite big now, about 12 feet tall. All of the green peaches (about 12) dropped when about the size of golf balls. Minimal leaf curl and still no peaches. 2009: Great growth, healthy tree, but still no peaches. It’s a light bloomer. I had this tree in my Seattle garden and it was a great producer of small sweet white peaches. 2008: white peach: vigorous growth, slow to leaf out, minor leaf curl, no fruit set. If I stretch a bit and go with the glass half full– I say just wait until next year. Of course, I say that every year. Even without fruit, peach trees are eye candy, beautifully ornamental and almost tropical looking in habit. So here’s to next year’s peach crisp, cobbler, pie and jam; may it all come from my own backyard. Good growing my friends, and here’s to keeping your eye on the pie — Tom. A traditional peach pie I made, ready to hit the heat for a little crisping up and oozing out. Wow…that is an exhaustive report! I wish I had room for a peach tree…or 10! They are pretty much my partner’s favorite thing in the world and I would love to be able to grow my own. The prospect of fragrant, juicy, golden-red peaches sucked me into planting, spraying, pruning, and finally — pleading with — several peach trees two years ago. Peach trees here will rip your heart out. After a painful break-up, I’ve come to appreciate zucchini, raspberries, and cucumbers; they grow anywhere. Just an aside: have you ever tried growing artichoke? Sea monkeys – too funny! 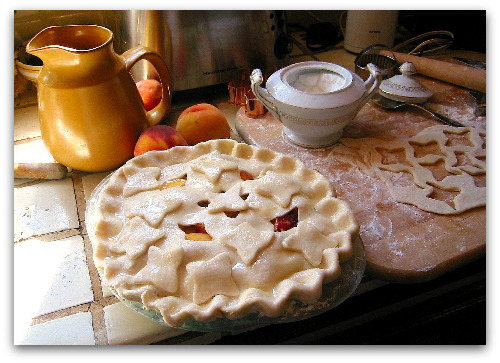 Your Indian Free peach looks incredible and as for the pie… you’d win another prize with that one. Hang in there and just wait until next year. It’ll be incredible (at least that’s what I remember my farmer Dad saying every harvest). Scott, I suspect peaches are your partner’s second favorite thing in the world. Portland’s warmer summer may be just thing to grow good peaches. Sure you don’t have an extra spot for one? Heidi, I had to laugh; yep, painful breakup indeed. Mine may be forthcoming. 😉 As for artichokes, yes, I love them and also grow cardoon, another thistle in which you eat the stalk. June, thanks — you’re Dad was no doubt a smart man and good farmer. Oh Tom..What a shame..I was hoping to hear a wonderful update about your peaches. This year has been awful (here in the PNW) for edible gardening. My tomatoes were waterlogged and everything else underperfomed in some way or the other. I only do the Frost Peach locally in my far Northern Cali coastal gardens. It seems to produce a bucket or so the 2nd year and many many buckets of peaches in the third year and beyond! Very little disease and a nice plant with a petite size and nice landscape form. If anyone can grow the unexpected it would be you (LEMONS). I don’t know of anyone who has ever grown great peaches in the Puget-Sound area, so that you’ve gotten some edible fruit off of a few trees is really something. I’m not sure the purple peach should count– purple fruits seem to like the PNW. Those Indian Free peaches are a thing of beauty. My fig tree only produced 5 figs this fall, and the squirrels get them before I do! That Indian Free Peach is just gorgeous! This year was a good one for our Breast of Venus peach tree, so I’m thinking all that manure and scaring off the ants with baby powder around the base did the job. 13 kilos of fruit and it was way more than we ever expected to harvest. Peach curl occurred in both the plum and peach, but it was so mild a case that the tree weren’t greatly affected. Good luck for 2011! Your Indian River peach is just stunning-wow. Cheers to your efforts to grow peaches. It’s a labor of love. I live about 10 miles from the Georgia state line where peaches grow plentiful. The climate is just cool enough winter and hot enough in the summer. Still, the beautiful varieties that you are sharing are not match for just your common Georgia peach. Rowena, that’s is the best peach name ever–you’ll never see that in a Harry and David catalog. 😉 Congrats on the great harvest and here’s to your slice of Dolce Vita. Velva, welcome and thanks for the kind words. Plentiful peaches…um sounds like a fine place to live. What an interesting post! these peaches have such a nice color! Thanks for the peach tree report Tom! We only have Frost at the moment, and are thrilled with it. We’d like to add a couple more trees to the orchard, but are running out room, so we’re trying to be selective. I’m glad to see that Indian Free is still doing well for you. We just ordered a bareroot one for our orchard, along with the Kreibich nectarine. I hope the nectarine does well here. We do have the advantage that our rains often don’t show until mid-late October. Don’t suppose there’s any of that pie left? 😛 It looks awesome! you have some lovely vareties, I have never seen the indian peach variety before here in England, i am going to try and get some. Do you have any experience with the el dorado peach? Or any other dwarf or semi dwarf trees that thrive in Seattle? Hi Nichole, in addition to the curl resistant trees I’ve mention here, there’s are super dwarf peach trees called genetic dwarfs that stay small and do well in large pots. Simply put them under a covered porch during the rainy season and this will keep them from getting peach curl. I’m wondering if you can answer a question for me since you have experience with the Q 1-8 peach. I purchased one recently from a nursery, shipped bare root about 4-5 ft tall, single trunk with no branching. How long does it take for new growth to appear on this variety? It was planted in late Jan of this year but hasn’t sent out leaves or new shoots. I know it’s still alive because I scratched the bark and it’s green underneath. Thanks for your help. Hi Terry, funny you should ask. I have a couple bare root peach trees I recently ordered that have yet to leaf out as well, the same is true for some plum and apricot trees. I’ve found it takes longer for a newly planted bare root tree to leaf out than its established counterpart. Not sure why, it may be it just takes them longer to break dormancy because they’ve been locked away in a consistently cold dark locker of sorts. The trees are no doubt stressed and trying to establish roots too, so leafing out is a lengthier process. If stems are green, I think the tree is still good to grow, and Q 1-8 has been a vigorous tree beginning year two. The adage is true: year one, sleep; year two, creep; and year three, leap! Thank you Tom for the quick response. I was just a little worried since all the plum varieties I’ve purchased at the same time have already leafed out. The Q 1-8 seems to be the only tree that’s still dormant. At least it’s alive. I’ll continue to wait and see what happens. Thanks for your time. I’m now anxious to see how you’re doing with your peaches. My Indian Blood is doing well after fifteen years. Last years, the tree produced hundreds. . . hundreds! This year, not so much! Last year I had to freeze gallons and was so thankful this year! Turned them into a syrup for a new drink “Hard Peach Punch”! Oh Patty, you’re killing me. Hundreds, eh? I didn’t get any Indian free/blood peaches this year. We had a horribly wet, even for us, spring, and pollination was nonexistent. Apple bloom was almost a month later and I had no trouble with pollination there. It’s kind of agonizing reading your posts, you guys! I had the same problems until someone told me the secret. After that, even when I returned from years away(total neglect), I had lovely peaches and nectarines ripening. Hate me yet? Just wait! They are reliable every year- and I live by northern rainforest, on an island, next the sea, and it’s cold and it’s wet. I’ve never sprayed them, and grow any old variety that shows up equally well. No curl resistant ones. No problem. Even if it’s cold and rainy right through June, and that’s not uncommon. Surely someone must have mentioned, sometime- maybe you didn’t believe them? Well, believe it! It’s magic! The secret is to plant against the south and or west wall of your home, outbuildings or what-have-you, hopefully with a bit of roof overhang. Before the rains resume, prune off fruited canes- like raspberries- and fasten the new ones to the wall(trellis, wires, or system of your devise) in a fan. I simply staple with house-wiring staples right into the cedar siding, near the end of the 3-4′ whips as well; otherwise they could break as the weight comes on. Some people use more of an espalier treatment like grapes. Hi Vanya, that is a great tip. I know I’ve seen peach trees in the UK growing on south facing garden walls and once when I was up on Vancouver Island, and Salt Spring Island, I noticed folks espaliering their stone fruit trees on the house and under the over hang. I think I may have to move my chicken house and try planting some around it and training the trees up the walls. My house doesn’t lend itself to that, hmm, maybe I’ll plant them under a hoop house. Ah, what ones does for sweet ripe peach. Cheers! To the person mentioning getting a hoop house to put trees in. . .Dont bother unless you also plan on buying bumblebees and hose them inside. Hoop houses mess with honey bees in a major way. I went to a wind tunnel training with ohio state university and they suggested bumblebees as polinators in windtunnels/hoop houses. Thank Nichole, I’ll check it out. It’s always nice to see how other folks are doing things, though I fear for my peach trees, poor pollination is the real culprit for low production. I got to visit his farm last year, he gives tours every sunday 2:30, I would suggest you go in september ish when his fruit trees are at their peak. You’ll never taste food so good. He’s a very sweet man and an arborist. He will have lots of great information for your tree adventures. Nichole, I’ll try to start some seedlings if I get any peaches with viable pits this year. Peaches seeds grow true to the tree, unlike apple seeds which are never like the parent tree. If you don’t want to wait or chance it Raintree Nursery and Peaceful Valley Organics, usually carry the tree this time of year, as a barefoot. oops, i forgot to say the tours are free and he encourages you to sample and take home any of his vegetables and fruits growing (it was like getting a really really nice csa) the rasperries are to die for. How did the peaches do this year? I have Charlotte, Frost, Indian Free and an unknown. The Frost and Unknown had a really great year. I’m wondering if this will be typical, or it was just a great confluence of factors. I’m in Camas, WA near Portland. So glad to hear you had PEACHES! Yeah!